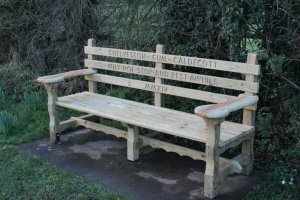 Cllr Wooding's bench on Caldecott Road, near the junction with Bidwell Lane. Cllr Wooding bench, near the junction of Bidwell Lane and Caldecott Road. Local Councils Centenary bench, near Hall Farmhouse, Water Lane. Queen's benches (x2), at the 305th BG War Memorial in Higham Road. Silver Jubilee bench, on the triangular green between High Street and Water Lane.